The premise of Mr Go is that a trained gorilla from China becomes a major league baseball star in South Korea. On paper, this sounds like one of the parodic Troy McLure vehicles from The Simpsons. Mr. Go does indeed paint in broad strokes, seeking wide appeal. It’s a rare Korean film, and is also a co-production with China. Despite the goofy central idea, Mr Go is more substantial than the gimmick it may at first appear to be. 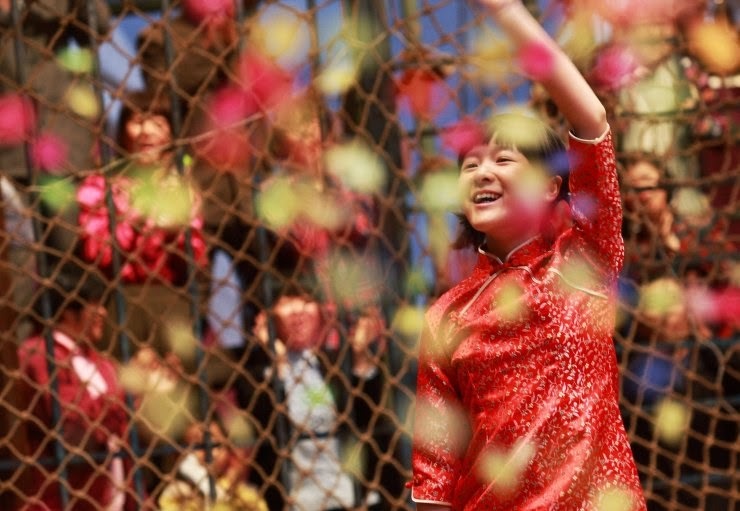 Uncharacteristically for such box office fodder, it begins with a tragedy; in the Sichuan earthquake of 2008, a young Chinese girl loses her grandfather. Orphaned and saddled with a massive debt, she works as a gorilla trainer in a circus, teaching her hairy ward to play baseball, among other tricks. With the debt mounting, and gangsters turning up and issuing threats to the circus, Weiwei’s only viable option is to sign a contract with the Korean baseball team Doosan bears, who have seen Ling Ling’s phenomenal baseball skills on a TV news item. The opening section of the film unfolds like a documentary, with interviews, shaky hand-held footage. The “mockumentary” form can grow wearying, especially with comedies that attempt to ape the dry Christopher Guest style, but here the documentary technique lends weight and credibility to a far-fetched and potentially farcical idea, so it’s a shame the film exchanges this style in favor of more conventional storytelling techniques. Perhaps surprisingly, the overall tone of the film isn’t comedic. Instead, it concentrates on two related dramas: the pressure on Mr. Go to succeed, and the pressure on Weiwei to save her circus. Her hardbitten sports agent Chung-su (known as “the Bounty Hunter”) continually promises the young girl money but keeps putting off exactly when this cash will appear. Xu Jiao puts in a sensitive performance as Weiwei, managing mostly to avoid the scenery-chewing and heartstring-tugging that blights many child characters in family-oriented movies. Sung Dong-il bristles with hubris as Chung-su. But of course the real star of the show is the CGI gorilla, Mr Go himself. This curmudgeonly reviewer was shocked to find himself empathizing with a computer-generated ape, but a great deal of work (and the performance skills of actor Kim Heung-rae, whose movements were used as a base for Mr. Go’s) paid off. Particular highlights include the gorilla destroying one of Chung-su’s rare plants to make a bed for himself, and Chung-su and Mr. Go bonding over several glasses of makgeolli (Korean rice wine). 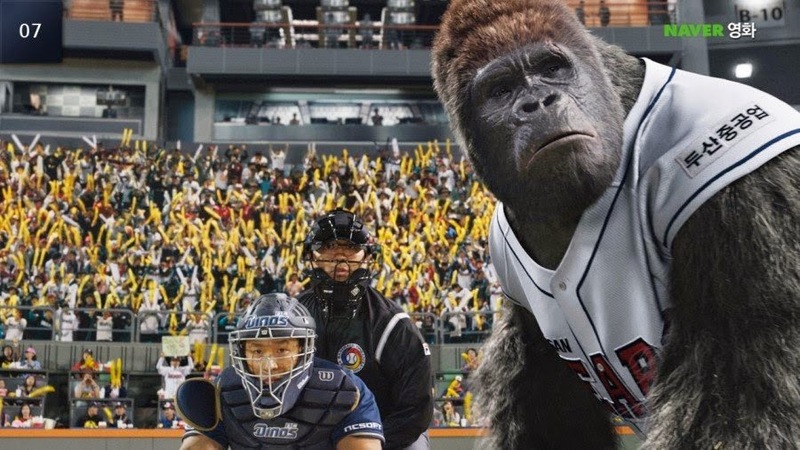 A gorilla brought to a big city for the entertainment of the urban masses is bound to remind one of King Kong, and sure enough, half-way through the film Mr. Go goes on a rampage through the Doosan Bears’s stadium, wreaking havoc as spectators look on in terror. This is a dizzying and tense sequence but it ramps up the excitement too early. After this exhilarating section, the film loses momentum and a rather predictable middle section in which the film over-eggs the question of whether an injured Mr. Go will be able to recover in time to play a vital game. The film ends with a showdown that at first seems surprising but is entirely in keeping with the rest of the film. Mr. Go is a fun and at times surprisingly moving film that suffers from slow pacing and an often predictable plot. However these shortcomings will likely not matter to young audiences and seekers of cinematic catnip in Asia and further afield.